Whilst wall stickers have been popular for a number of years for their ease of putting up and their ability to transform a space, I do wonder if we are missing a trick with wall stickers. Should we be utilising them in a different way to provide prompts, organisation and motivation around the home? I don’t like anyone having shoes on in the house, whether that’s the kids coming in from the garden, Mr. Boo returning home from work or myself after a busy shopping trip. Those shoes have been everywhere, trending in, well, anything and everything and I don’t want the dirt and germs traipsed through the house. 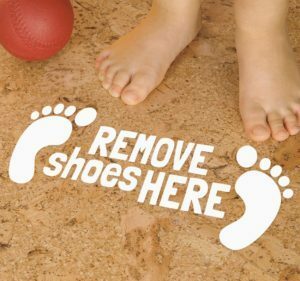 So we have always had a shoes off at the door rule in our house and this fun remove shoes here floor sticker would help reinforce that rule and make guests also remove their shoes too. 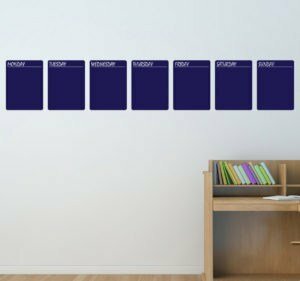 I’m a busy mum of three who likes and needs to be organised so this blackboard weekly organiser sticker would be perfect for the kitchen. The blackboard could help keep track of appointments, activities, Mr Boo’s work days and everything else that family life throws at us. Whilst I may not have travelled the world I still have hopes that in the future (once the children have flown the nest) that Mr Boo and I will head off on some grand adventures. The places I have been to icon stickers are great for pairing up with a map of the UK or the world depending on how much you have travelled, personally, I would opt for two colours for places I have been and places I want to see. When I left school there was a fabulous song in the charts that even not makes me think every time I hear it, Baz Luhrmann – Everybody’s Free To Wear Sunscreen. The words seem to never age and mean more to me with each time that I hear it. 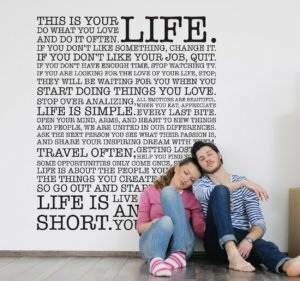 The lessons of life wall sticker offers the same feeling, each time you walk past you a couple of words will pop out at you and strike a chord with how you may be feeling that day. 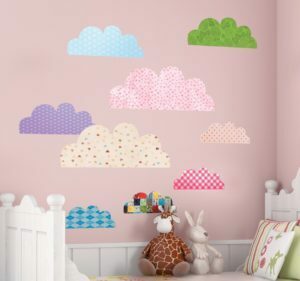 Probably the most common use of wall stickers is brightening up kids bedrooms and play areas. Whether you are designing that special nursery for your newborn, moving them from cot to bed or just giving their room a makeover kids wall stickers can transform a space easily and can be changed just as easy when your little ones have decided that they what something different. Plus they look super cute too, which obviously is important. Do you have wall stickers in your home? Lovely ideas! The cloud stickers are so cute.